England abandoned our Grand Jury process. Why shouldn’t Multnomah County? We appreciate that concerns grow, nation-wide, for police accountability. We appreciate especially that communities are knitting together. When the President of the Portland/Beaverton Oregon Chapter of the National Action Network (NANPBO) brought up these concerns about the role of grand juries, we took note. The Grand Jury was originally a safeguard. Before the Crown could take action against a subject, his peers had to agree there were grounds for indictment. (Our former colonial oppressors have since abandoned the secret process.) The Grand Jury is not an open contest of facts. No judge oversees whether justice is done. It’s a directed, one-sided affair. It only determines whether a trial should convene. Grand Juries are conducted by a county District Attorney, who generally works with law enforcement, to make cases against defendants. The process consistently fails when DAs are asked to indict their co-workers. The DA got a judge to open Otis’ juvenile records, protected by a previous court order. The dead man’s youthful shoplifting charge had nothing to do with the decision to pull him over; the ‘evidence’ was used to portray the victim as a criminal who needed killing. 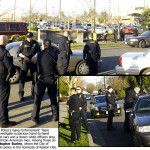 Officers were allowed to assert – unchallenged – that Otis “looked like a gangster.” Otis had no gang involvement: the coded message was that a young father was Driving while Black; slouching and, almost two years before Trayvon Martin, wearing a hoodie on a warm day in early May. The DA does investigate, but only to impeach testimony outside the police narrative. S/he does not seek to build a case against cops. In a purer pursuit of justice, lawyers represented James Chasse’s heirs in a civil trial (the result of a lawsuit, not a DA’s Grand Jury). It was by enhancing video of police comments after they dragged Chasse’s broken and dying body to a jail that refused to accept it for booking, that induced a jury to award damages to heirs and survivors. * In contrast, the county DA is not curious about anything which detracts from the police narrative of what happened. Police are not in the habit of enhancing evidence of their own misconduct. The Grand Jury process is to be a stepping stone to criminal trial in open court. It is in that subsequent venue where conflicting evidence is tried before a judge or jury. It’s adversarial; someone actually speaks for the victim. However, DAs are using the Grand Jury process to prevent an open contest of the facts. The Grand Jury is supposed to be merely a ‘check in’ with The People. If there are two sides to the story, the case is supposed to go to trial … so we can find out who is lying. A DA can, under current law, argue there is no reason for a Grand Jury to send a case to open trial. If the officer informs a Grand Jury (without being exposed to cross-examination) that he or she was in fear of her life, the DA can explain no trial is necessary. We introduced SB 781 (at the link) to change that ‘stay out of jail’ standard, to allow a jury of our peers – at trial – to determine whether a reasonable person would share that officer’s fear, given the circumstances he or she (created or) found themselves in. 12 white officers converge on 2 persons of color. We also share the NANPBO President’s contentions: racial injustice has unbroken links to slavery times. 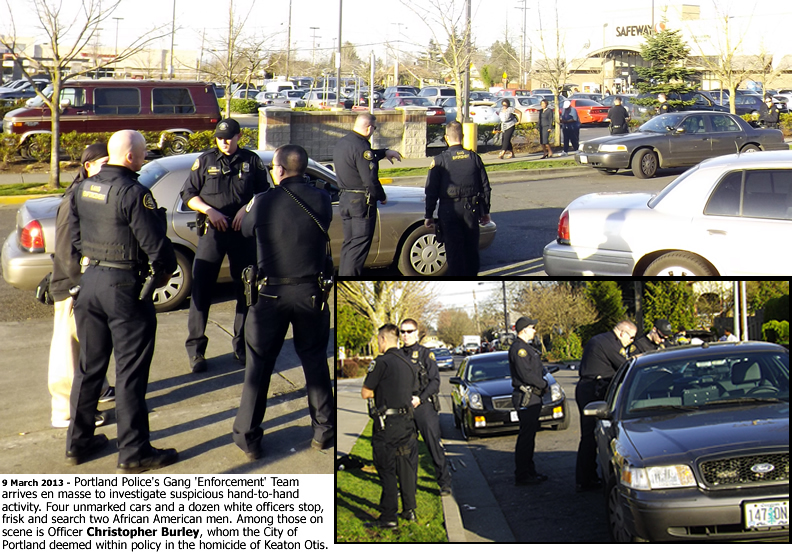 Should the reader see Portland’s Gang ‘Enforcement’ Unit in action (right), they’ll understand these armed men as the modern equivalent of slave patrollers of old: the gang unit employs surprise, overwhelming numbers, and the threat of mortal harm, to suppress people of color in the pursuit of completely legal activity. We contend it is much more important to film police interacting with people of color … than it is to ask cops to wear cameras pointed at The People. Perhaps, after a couple years of actually having processes in place – which discipline cops – we should begin to assess new surveillance devices. We extended our hand in organizational unity outreach and you accepted and connected with us to solidify our struggle to secure social, educational, economic, racial, criminal, and political justice for all.